Pakistan will not allow the UN to inspect its nuclear programme, President Pervez Musharraf has said. Islamabad will co-operate with the UN atomic agency, the IAEA, but will not hand over any documents, he said. He was speaking after pardoning Abdul Qadeer Khan - the top scientist who admitted leaking nuclear weapons secrets to Iran, Libya and North Korea. 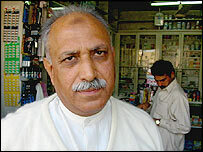 IAEA head Mohamed ElBaradei has said Mr Khan's revelations are only the "tip of the iceberg" of illegal trafficking. In Washington, the director of the CIA, George Tenet, said that the exposure of Pakistan's leading nuclear scientist followed a series of daring operations by American and British spies over several years. Mr Tenet said Mr Khan had been guilty of nuclear profiteering on four continents. And he said the revelation of his activities would put back the nuclear ambitions of some countries for years. The BBC's Jon Leyne in Washington says US officials are concerned about a new era of proliferation with not just governments handing over secrets, but individuals too. He adds that no-one believes Mr Khan acted on his own and there will be private pressure from the US to its ally for all the facts. Mr ElBaradei also concluded that the scientist was "not working alone". Later, an IAEA spokeswoman told the BBC urgent work was needed to cut off the so-called "end-users" of proliferated weapons information. The Pakistani president said "if the IAEA wanted to come to Pakistan and discuss the results of the Pakistani investigation, by all means, we are open". But no inspections would be welcome, he said. Foreign minister Khursheed Mahmoud Kasuri said Pakistan was a "responsible nuclear power", under no obligation to allow inspectors to "peep into our programme". He said Pakistan was willing to co-operate with the IAEA on information Dr Khan may have told them about Iran, Libya and North Korea's weapons programmes. "Anything that is appropriate to that particular function of the IAEA we will share," he told the BBC's World Today programme. "But anything that impinges on our own national security is out of the question." 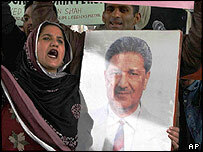 The nuclear scientist, a national hero, made his public confession on Wednesday after meeting General Musharraf. Mr Khan told the nation he had acted without authorisation and begged forgiveness. Correspondents say there was huge public opposition to putting Mr Khan on trial. They say pardoning him avoids the potential embarrassment that could result from a public prosecution - even though it could spark allegations of a cover-up. The BBC's Jim Fish says experts are deeply sceptical that Mr Khan's alleged proliferation network could have spread so far without the complicity of some in the government. Raza Rabbani, a former government minister and acting secretary-general of Benazir Bhutto's opposition Pakistan People's Party, demanded more information about Mr Khan's activities. "That is why the opposition in Pakistan and particularly the People's Party has been demanding that there be a parliamentary inquiry into this whole episode." 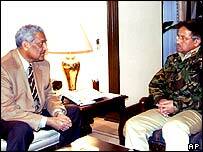 But Mr Musharraf said no independent inquiry would be allowed. Pakistan began an inquiry into possible illegal transfers late last year after the UN passed on information it had gathered about Iran and Libya's nuclear programmes. More than 15 people from the nuclear enrichment facility that Mr Khan used to run, Khan Research Laboratories, are still being questioned in the nuclear transfers investigation.